My heart is aching. 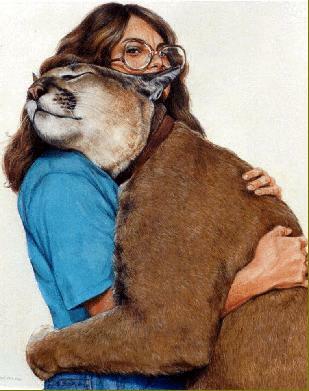 Cinnabar cougar is at peace now. He had stopped eating last Wednesday. Thursday I administered some fluids I had on hand and Friday called the vets to discover that three out of three vets we use were not working that day and Dr. Adney was not scheduled to return until Tuesday. We drove to town and purchased more fluids and administered them with medicines and B-complex shot in hopes it would reactivate his appetite. Saturday morning he showed momentary interest in breakfast then dropped it and later buried it. I knew in my heart he was very ill, though his eyes were bright and his spirit strong. I spent a lot of time with Cinni that weekend, sitting beside him; his head lay on my lap, stroking his fur and telling him how much he was loved. He purred and talked to me. Monday I scheduled an appointment with Dr. Adney for first thing Tuesday morning and we loaded him into the transport cage that evening. We told him we would get him help. And I blocked out the thought that we might not. Tuesday morning we awoke to a beautiful fall morning after a light rain the night before. The 70 miles drive to Hot Springs revealed that fall colors are finally peaking out. The morning sky was beautiful blue and the clouds had silver linings. It was a beautiful day to be alive. Cinnabar's examination revealed that his abdomen was filled with fluid and initial slide examination indicated it was not infectious in nature. Many of the cells however, were abnormal. His plasma was yellow; a sure sign of Biliruben and the BUN was also above normal. Prognosis was not hopeful and considering his age, and his previous back injury, we made the decision to forgo further tests and treatments. I had spent the past week day and night crying while I tried to plan for this moment, and wondered if there was some way to have him at home in his woods for this. But I did not want him to wake up to experience more pain just so we could be home in our beautiful woods. And I was not sure I could do it, or when I could get a local vet over. Cinnabar was in his transport cage in the back of our truck and of all things while we were deliberating our options a yardman was running his leaf blower. I could not believe his last moments on earth were surrounded with such horrible noise and so we waited until he was finished. Cinnabar was under the influence of ketamine and not really alert to the noise, but I was. It was in such contrast to the peace and quiet of his life with us. I crawled into his cage with him and sat beside him, and stroked him, telling him how much we loved him and we spent a long time like that. Then Dr. Adney came back with the sleep away and all the racket of before was gone and it was time. He injected the pink liquid into a vein in his forearm. The life forces left my dear sweet son, and it was all over so quickly. We covered him in the blanket and drove home in teary silence. I was thinking about where to bury him. Our graveyard is getting full. It will not hold 9 more cougars; we are going to have to choose another spot. And I thought about his brothers, Arjan and Sharu and how they needed to know about Cinni. We stopped at a garden shop on the way home and the lady asked what was in the cage. I picked out some pansies and some beautiful bright mums for his grave and the garden shop owner hugged me and told me her animals were her children and she understood, and then she added another pot of mums to our collection. Finally, we talked about where to bury Cinni and agreed we would lay him in his woods. Bart dug his grave in their exercise yard, and we lay Cinni next the enclosure wall for his brothers to see. Arjan spent a long time sitting next to Cinni and looked at him. Sharu would not come near for the longest time. Then he walked over to Cinni and spoke to him and then turned to Arjan and spoke to him. 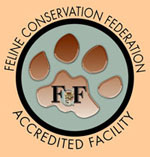 We had to clean the cages of cow bones and feed the living cats their dinner. We were too tired to bury him that day, and I was not ready to see him go. After the day's chores were done, I took a blanket over to Cinni and lay down beside him and hugged him and stoked his fur for a long time. He looked so old, and his belly was so big. With all the weight he lost, he still weighed over 200 pounds. I covered him with a blanket for the night. wasted away and his backbone was visible. We began to examine his organs and discovered Cinnabar's liver was completely covered in hideous cancerous tumors. And when we saw it I felt a wave of relief that we had made the right decision and then we both wept uncontrollably and I kissed his beautiful face and stroked him. He didn't want to leave us. When Dr. Adney injected the sleep-away into his arm, Cinni still had a very faint heartbeat and an occasional breath. Dr. Adney apologized to me, and stated that he had tried to avoid this, but he would have to get more sleep-away and inject directly into Cinni's heart. Then he said "He has such a strong will to live". That stuck in my mind and I panicked inside - what are we doing? Can we turn this around, who am I to end his life? But now I understood, and I also know that Cinni knew and he did have a strong will to live here with his brothers and us in his beautiful woods amongst complete serenity and love. Cinnabar's whole life he had freedom from want and freedom from fear. He was loved deeply and he returned it freely. I removed that cancerous liver from his perfect body and stroked him. He looked much better, with the swelling gone his body looked massive and strong again. Bart had positioned him in a comfortable repose for his everlasting rest. We carried him over to the burial site and covered his body in earth. Then I planted the mums and pansies above him and surrounded his grave with quartz rocks. It sits in the sun, just a few feet from where Cinni lounged so often. 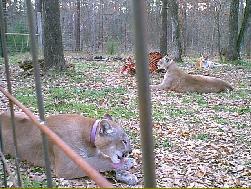 Cinnabar Cougar, born July 13, 1988, died October 14, 2003. He is survived by his cougar parents, Mercury and Tara, his littermates Arjan and Sharu, his younger brother Sammy, his two nieces Atika and Sheila and his great nephew, Caesar. 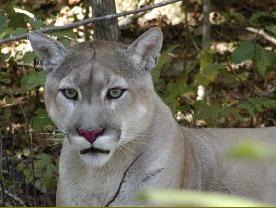 Cinnabar was a most remarkable and loving and gentle cougar. He enjoyed a full life. He was co-raised by his cougar mother Tara and us. He and his brothers spent most of their lives roaming their five-acre fenced-in woods. Cinni and his brothers were the subjects of my early behavior research, documented in two videos, "Cougar Development, Birth to 29 months" and "The Endless Summer", video footage of these three as youngsters playing on the islands of Lake Ouachita taken during numerous trips on our boat that summer. We love you deeply Cinni. We hope to see you again someday.